The Book of Beasts: Legendary Foes, the latest in the award-winning Book of Beast series, details the deadliest and most frightening monsters ever to grace your gaming table. Bring new life and peril to your mythic adventures with these fierce monsters and high level NPCs. 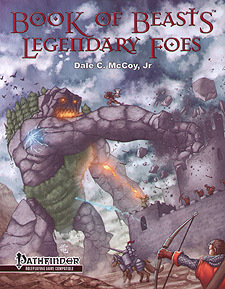 Challenge your players at a whole new level with demigods and traps for the highest levels of gameplay from this 68-page, full-colour monster tome.